Holy Week allows us to re-enact, relive and participate in the Passion of Jesus Christ. We began the week by gathering together as a whole school in the playground for our first Liturgy of the week, to listen to readings and prayers followed by the children waving their palms as we sang the song "Hosanna" to show the joy and praise the people would have felt when they welcomed Jesus into Jerusalem. We then processed around the school's perimeter with our palms held high. Lenten Reflections including The Stations of the Cross will take place in the school Chapel at 8.30am throughout Lent, every Monday from the 11th March - Parents and families are invited to attend. Today a representative from CAFOD, came to talk to the whole school during a special assembly to let the children know what the money they are currently raising throughout Lent, will go towards. We began celebrating the feast of St. Joseph with the whole school attending Mass at St. Bernard's Church (with some of our pupils taking part in the readings, bidding prayers and the Offertory). The Mass was followed by a day packed with fun filled activities including arts and crafts, games, challenges and a singing competition (each class created their own songs about our school which were later performed in the dining hall). The children enjoyed an extra special school lunch and every child went home with a St. Joseph's goodie bag. Pupils and their families joined us at last week's Lenten Reflection which took place in the school chapel before the school day began. CAFOD Family Fast Day is a day when we are invited to go without something – and the money we raise is collected and given to the very poorest people around the world who don’t have what we have. This year, during Lent we are raising money for CAFOD and on Friday we asked every class to donate enough money to buy a family a goat! We managed to raise enough money to buy a goat for 6 families. A representative from The Forget-Me-Not Children's Hospice came to talk to the children about the work they do and the sorts of things that the money raised by the children during Lent will go towards. The representative then drew the raffle for The FairTrade Hamper which was won by a pupil in Year 3. Each class made a Lenten Cross. We have been making our Lenten Promises. Many of our Year 3 children received the Sacrament of Reconciliation for the first time, along with other children from across the Halifax Deanery, at a special service held at St. Bernard's Church on Saturday 9th March. The School Council introduced FairTrade Fortnight during an assembly. They will be holding a "Great British Bake Off" and will be producing some FairTrade Easter gingerbread treats using fairtrade ingredients. More details will follow at a later date. In the meantime they are currently selling raffle tickets for a chance to win a hamper full of FairTrade goodies. Yellow Team celebrated St.David's Day with a party in the school hall. Our Year 3 children will prepare for their First Confession from this January. The dates for the meetings are below and each child must attend every session with a parent or carer. If you cannot make it to our school session then you need to attend one of the others listed below in the same week. The content of the preparation in each school is exactly the same. Here are the children taking part in the first workshop with their parents. Several of our staff and pupils attended Mass on Sunday 6th January. It was lovely to see so many of the pupils families and parishioners joining us at our annual whole school Advent Service in St. Bernard's Church, Halifax. School Council Representatives joined parishioners at St.Theresa's Church, Queensbury for Mass. Some of our Council Representatives took part in Monday's Mass held at St.Theresa's Church in Queensbury. Afterwards the pupils joined the parishioners for refreshments and a chat. Thank you to all those who donated a gift in a bag for St.Bernard's Fayre. The stall was very busy on Sunday and was run by some of our KS2 staff. Pupils and staff from EYFS attended Sunday Mass (First Sunday of Advent) at St.Bernard's Church. As part of our preparation during Advent, a travelling crib has been given out to each class. Children will take it in turns to take the crib home for the night to set it out, pray and reflect together as a family in front of it. Diocese Singing Lessons for Years 3 and 6. Year 3 and Year 6 have a weekly singing lesson through the diocese. They learn a range of varied repertoire that includes sacred and secular songs. The children are taught the fundamentals of singing technique including posture, breath support and diction as well as singing in parts. Both years groups really enjoy their lesson and sing with confidence and enthusiasm! Here are the children performing to the rest of the school. Our blue team had fun today celebrating St. Andrew's Day with lots of fun activities, competitions and food! We would like to say a huge thank you to all those who contributed to the ShoeBox Appeal. These boxes which were full of stationery, gifts, toiletries and non-perishables foods are now on their way overseas bringing a smile to those less fortunate than ourselves. Well done to our School Council who took charge of this fund raising event. This year the pupils were asked to come to school in brightly coloured tights or socks. We managed to raise £132.30 in total. Thank you to everyone who contributed. 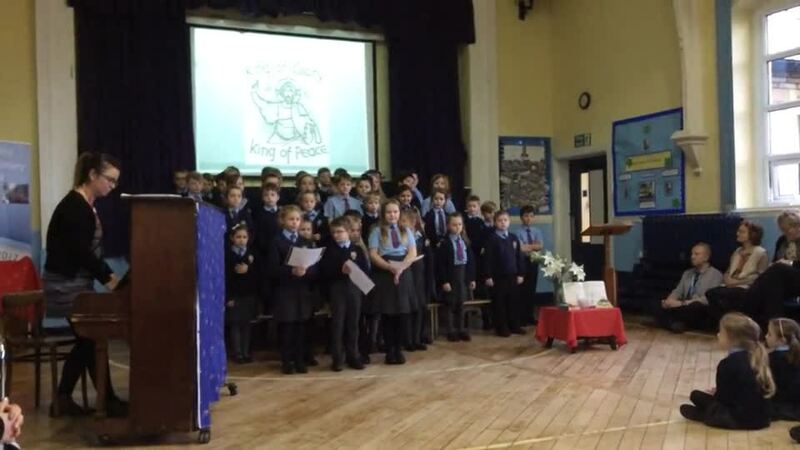 Children, staff and visitors were moved by the Remembrance Assembly presented by the children in Year 3. Over the past couple of weeks we have been selling poppies in school to raise money on behalf of the Poppy Appeal. Throughout November children are taking it in turns to take home a Remembrance Prayer Bag for the evening, to share and pray with their families. We would like to say a huge thank you for all your harvest donations which have now been delivered to the Drop-in Centre, Halifax. The project is run by Christians Together. They provide food, meals and essentials to the most vulnerable members of our local community which include the homeless and those experiencing financial hardship. Our Head Boy and Head Girl, along with Mr Crook and Mrs Mckidd delivered the donations and had a guided tour of the building as well as the opportunity to find out how the centre helps the community in many different ways. Today, all the pupils and staff joined together to Pray the Rosary in the playground. The rosary was dedicated to a prayer for unity and peace throughout the world. Our Harvest Assembly was led by Year 2. It was wonderful to see so many parents and families join us on this joyous occasion. May we take this opportunity to say thank you for your kind donations of food and toiletries so far. Whole School Mass took place in our school hall, led by Father Bob. We are asking pupils and their families to donate money they save from eating less at one of their meals on Friday 5th October to give to CAFOD. Throughout October pupils and staff will be using our School Chapel to Pray the Rosary during their lunchtimes. Prayer bags will also be going home each night with a different pupil to Pray the Rosary at home with their families. We would like to say a huge thank you to everyone who contributed to the MACMILLAN coffee morning and bun sale. We managed to raise £240.25.